A rare photo of the exterior of the Carmel after it had been renamed the Paris. One of the more surprising vanished venues in the district is a movie theatre that opened in 1924, the Carmel/Fox. It survived the transition from silent films to talkies and continued to show first-run films until 1952. It reopened from 1955 to 1957 as the Carmel Museum Theatre, which showed first run and classic titles. In 1957 it was briefly converted into a legitimate theatre called the Carmel. In December that year Molly Picon appeared in “The Farblondjet Honeymoon,” which an advertisement described as a “Yiddish-English Speaking Musical Laugh Riot.” Next up was “Simply Heavenly,” a musical with book and lyrics by Langston Hughes, which opened in February 1958, fresh from a 62-show run in New York. In April “Legong,” a dance concert featuring Gene Kelly, Igor Youskevitch and Tamara Toumanova, opened and ran for several weeks. But by October, the Carmel was a movie house again, showing Steve McQueen in “The Blob,” which had premiered a month earlier. The renovation of the Carmel from cinema into a legitimate venue appears to have been undertaken by a group who intended to rename it the New Vic. A series of photos shows young actors painting and doing construction on the building’s interior. But a scour of the Times’ archives produced no listings or ads for plays at the New Vic at that address. 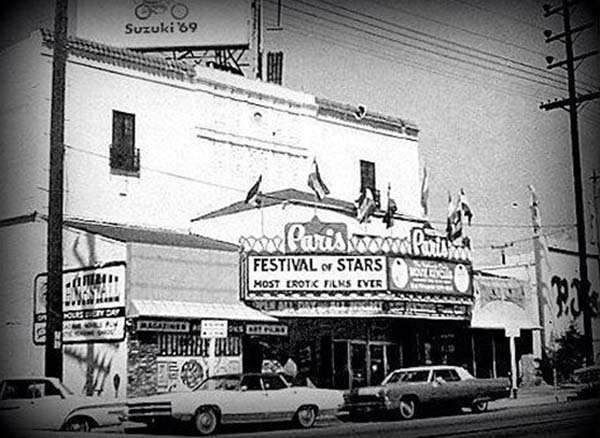 The theatre later was later renamed the Paris, which advertised adult films featuring “All Male Action.” The building was destroyed by fire in 1976. The building that’s there now houses two restaurants and a smoke shop.